Pictured here is a complete bracket from this year’s tournament. Virginia managed to win their six games, on their route to redeeming themselves from last years disappointing loss. “I was surprised the franchise finally won, but that team had so much talent,” said Evan Simonds ‘19. After being the first ever one seed to lose to a 16 seed the year before, Coach Tony Bennett and the Virginia Cavaliers had to redeem themselves. Virginia started their tournament run-off slowly again this year, as they were again in a close battle with 16 seeded Gardner Webb, trailing after the first half. Virginia never gave up in this game, which would eventually become their mindset for the rest of the tournament: never give up. Virginia then breezed by ninth seeded Oklahoma and the 12th seeded Oregon. The next three rounds, however, proved to be rather difficult. In the Elite Eight they played Purdue, in which they were down three with under five seconds to go. After a game tying shot from sophomore De’Andre Hunter, Virginia proceeded to win in overtime. Then in the Final Four, Virginia played fifth seeded Auburn, again coming down to the wire. With 17 seconds remaining in the game, Virginia managed to come back from a four point deficit , after junior Kyle Guy made three free throws to win the game by one. Finally, in the game that mattered most, Virginia went up against the three seed Texas Tech in the championship. Virginia seemed to have good control over this game, until they threw it away in the final few minutes. In the final 12 seconds, Virginia was down three, until De’Andre Hunter made another clutch three pointer sending the Cavaliers to overtime again. Virginia took control of overtime, as they ended up winning the final game 85-77. 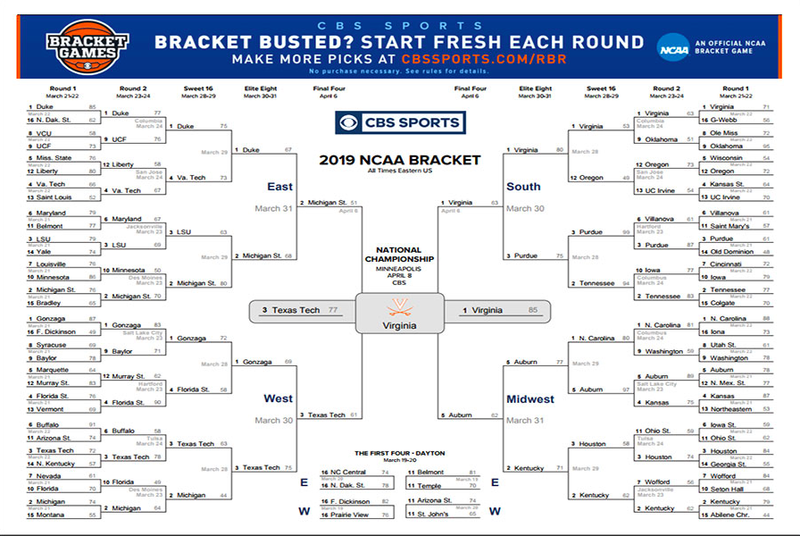 Even though Virginia did not enter the tournament with the highest odds of winning, it wasn’t a huge surprise this team won it all. This team was built to win a tournament, as they showed throughout the regular season by having the best record. To be this good, you have to have good players and an experienced coach. Virginia was known for having the best two-way trio in the country: Kyle Guy, De’Andre Hunter, and junior Ty Jerome. “They’re good on both ends of the floor and form probably the best nucleus in college basketball,” said CBS Sports senior writer Matt Norlander. Even though a one seed won the tournament, it was still loaded with upsets and brackett breaking games. A major surprise to many college basketball fans were the early exits made by Duke and North Carolina. Duke had an amazing lineup of players, all projected to go early in the NBA draft. Along with this, they had one of the most winningest coaches in college basketball history, Mike Krzyzewski. Even with all of this, Duke still managed to lose in the Elite Eight to Michigan State. 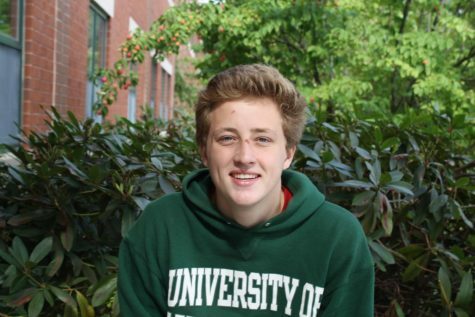 “Duke is just too young to perform under the bright lights,” said Evan Simonds ‘19. Simonds was also very disappointed in UNC after their lose to Auburn, but “Auburn did get very lucky at the end,” he said. Every tournament features many upsets, and this year didn’t disappoint. From teams getting their first ever win in a March Madness tournament, UC Irvine, to “Cinderella teams” making it to the Sweet Sixteen. However, the team that surprised people the most this year was actually a three seed, Texas Tech. Even though this team was seeded high, they weren’t projected to make the championship game, and not even projected to make the Final Four. Texas Tech was built like Virginia, and everything starts with the defense. This team went into the tournament known as a great defense, but everyone was shocked by how amazing their offense was. The Texas Tech offense was propelled by “the best player [Jarrett Culver] in the final four,” said Houston news writer Keith Dunlap. Jarrett Culver is a projected NBA top 10 pick after winning the Big 12 player of the year award, and averaging an impressive 20 points per game. A year after getting embarrassed by a 16 seed, Virginia came back to win it all with their never give up mentality, suffocating defense, and impressive offense. For some teams, this tournament went down as a success, such as UC Irvine, Oregon, and Texas Tech, while other teams will try to build off of a devastating ending and get redemption next year.